At Summit Park Church we love kids! 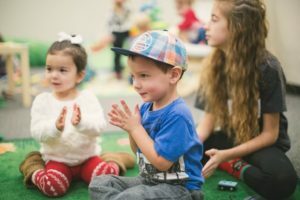 From infants to elementary age, we have done our best to help your children have a blast while learning about God. We have created a fun and safe environment for them by implementing our kids’ check-in and check-out system. If you are attending church for the first time, you can easily pre-register your kids online by filling out this form. When you arrive at Summit Park Church, simply proceed to the first-time child check-in station and inform them you have pre-registered online. We understand that kids’ check-in at church can be tricky sometimes, so we have plenty of volunteers ready to help when you arrive. If you have any questions at all just look for the people with the red or white lanyards. We can’t wait for you to arrive! We want to connect parents to what we are doing at Summit Park Church Kids. You can sign up to get weekly recaps emailed to you of what we cover. Yes, safety for our kids is a top priority. Every volunteer who works in the kids area has gone through our extensive background check and our kids rooms are monitored by our safety team. We also utilize a computer check-in and check-out system. It is a huge responsibility to entrust your kids to us and we take that very seriously. If your child becomes fussy while in class, we will do our best to help calm them down. Our goal for them is that they will love coming to church and beg you to bring them back the following week. If we are unable to calm them down, you will be notified via text message. If you are coming to church for the first time, it typically takes 3-5 minutes for the check-in process. We will get some basic information and take pictures of the parents and the children. To save time you can always pre-register online. Plan on arriving 10 minutes early so everyone can get settled into their proper classes before service begins. After you check in your child once, you can then utilize our self check-in stations. The first-time kids check-in counter just to your right when you enter the atrium. You can also go directly to the Welcome Center located in the atrium when you arrive and a host will help you with the entire process. We have large signage and friendly volunteers that will help show you the way. We also have hosts outside that can assist you by answering questions or even help unload the kids. Summit Park Church is a church for people who are not familiar to church. We encourage people to come as they are and dress in what feels most comfortable. Your child won’t feel out of place and they do not need a special outfit to wear. Each week we have free refreshments for the entire family before each service. Normally we offer bagels, small donuts or bite sized cinnamon rolls. We also serve coffee for the adults. During the service we typically have snack time in class that consists of Gluten Free Rice Chex. Parents of kids who have allergies often send an appropriate snack with them. We utilize a bright yellow allergy sticker to remind the teachers. Additionally, we pass out candy for special rewards in some cases. Each week we have prepared an age appropriate lesson that will teach kids about God and His love for them. We go to great lengths to make sure kids have fun during the service. The teaching is interactive and utilizes multiple approaches for different learning styles. Our goal is for kids to understand who Jesus is and how He can make a difference in our lives. Summit Park Church Kids is led by Ashton Myers. With all the items kids need, something is bound to get left behind at some point. Parents can pick up lost items on Sunday or throughout the week (Monday – Thursday). Inform the person at the Connect Center desk that you would like to check the Lost and Found. It is also helpful to label a child’s belongings (cups, coats, bags, etc.). You can print off extra name tags at Summit Park Church to help label these items as well. Yes, you are welcome to have your kids join you in service. We do have a live feed to a television in our foyer if the young ones get noisy and you need to slip out for a few minutes. When you and your kids are ready we will do our best to make sure they have a blast at Summit Park Church Kids.